Reduce production down time, off-spec product and time-consuming manual grab sampling in food plants with inline instrumentation. By Ola Wesstrom, Food & Beverage Industry Manager – Endress+Hauser. Food plant managers are faced with many challenges today, not the least of which is ensuring product quality. Depending on the product being made, they may have to meet the requirements of the Food & Drug Administration (FDA), European Union (EU), and an alphabet soup of other agencies and regulations, including cGMP, GFSI, ISO, HACCP, SQF, SID, etc. These regulations specify proper ingredients, chemical and biological hazards, procedures and sanitary conditions. Food plant managers also have to meet the expectations of consumers for proper taste and texture. For example, the pH of certain products is critical, because it can affect taste as well as food safety. When adding citric acid to jams, beverages and other products for acidification, pH must be carefully controlled. Currently, food plants rely on laboratory analysis of samples collected manually to ensure product quality at various points in a process. Lab technicians periodically take a grab sample, hurry back to the lab for a quick analysis, and communicate the result to plant personnel. Operators and maintenance personnel then make adjustments and corrections to improve control of the process, or to make repairs when required. The challenge with relying on lab analyses is that it’s not done in real time, it’s time-consuming, it’s labor intensive and it has possibility for manual errors. If it takes 30 minutes to grab a sample and analyze it, then the result represents where the process was 30 minutes ago — not now. The result could be a spoiled batch. If the measurement had been done inline, a sudden deviation would be detected, allowing for instant corrective action that could save the batch. In this article, we’ll show examples how readily available instrumentation can be used for online quality control to supplement or replace laboratory testing, speed up measurements, enable immediate corrective actions, and automate the parts of the quality control system. Using inline analysers helps management deal with many issues. For example, the amount of disinfectant used on a hydro cooker for canned food needs to be closely controlled to ensure food safety, as overdosing can cause corrosion and waste of chemicals, while too little can compromise food safety. One plant previously monitored disinfectant by taking grab samples to a lab for analysis twice an hour. Inline analyzers were installed to measure free chlorine, pH, and conductivity of the disinfectant. Real-time measurement saved US$13,000 annually in disinfectant costs by eliminating overdosing. These measurements also allowed the automation system to add makeup water based on measured values, saving on heat energy and water usage, and producing less wastewater. The inline analyzers also eliminated the need to send a lab worker to the hydro cooker two times an hour to take grab samples. The bottom line was a payback period of just seven months. In a similar example of how inline analyzers can cut expenses, a cheese plant performed five clean-in-place (CIP) operations per day. The chemicals cost US$1,771 for a 30-gallon drum, and the plant used three to four drums per month. The plant installed an Endress+Hauser OUSAF11 optical phase separation sensor. Using visible and near-infrared wavelengths of light, the OUSAF11 can be used for product loss detection, interface detection, and suspended solids and turbidity measurements. By measuring phase separation between whey, water and CIP detergent in the line, operators were able to determine when the pre-rinse and CIP was complete, instead of relying on lab measurements and timing. Each CIP cycle was reduced by 15 minutes and the plant used 32% less CIP chemicals. The cost savings were US$5,300 in the first three months on chemicals alone, plus savings from reduced energy and water use. The plant also increased equipment availability for processing by more than one hour per day. Experiences in the industry with analyzers have been mixed. Trying to apply equipment designed for use in the lab directly in a process usually led to disappointments. Washdown, high temperatures, aggressive cleaning chemicals and other environmental factors often resulted in equipment failures and maintenance nightmares. These problems have been rectified by designing analysers and other inline instrumentation from the ground up for use on the plant floor and in the field. Traditionally, instruments were analog devices with a single 4-20mA output. Today, the availability of digital outputs such as EtherNet/IP, Profibus, Foundation Fieldbus and Hart is making integration of information into automation and information systems very easy, and also allowing multiple parameters to be obtained from a single device. For example, a Coriolis flowmeter can provide mass flow, volume flow, multiple totalizer values, density, viscosity and temperature measurements along with diagnostic information over one set of wires (or wireless). These digital protocols also help improve accuracy by eliminating A/D conversions and loss in resolution of signal transmission in an analog 4-20mA signal. With the expansion of digital sensor technology, the lab can now take responsibility for calibration of quality-related measurements. For example, to calibrate a pH sensor in the past, calibration equipment had to be brought into the plant. Today, this calibration can be done in the lab in a controlled environment, and the pre-calibrated sensors can be easily placed in operation. Endress+Hauser Memosens and other similar technologies make this possible for pH, DO, conductivity, turbidity, chlorine and many other parameters. One of the limiting factors for inline quality monitoring has been the lack of instruments meeting hygienic design requirements and resistant to thermal processing and CIP chemicals. Today, most instruments meet with EHEDG or 3-A sanitary standards and are designed for use in the food industry. An example is pH measurement, which most people associate with glass sensors – a big problem in food processing as glass sensors can break and end up as foreign objects in the final product. Now there are reliable non-glass pH sensors that meet food processing requirements. A single Coriolis flowmeter can measure a number of parameters simultaneously, often eliminating the need for multiple instruments, and their highly accurate measurement of mass flow and density (up to 0.05 percent on mass flow and 0.0005g/ cubic cm for density) makes Coriolis ideal for many process control applications. One food plant installed a Coriolis flowmeter in a continuous bypass line of a batter mixing tank. The batter, consisting of flour, water and additives, is mixed until the correct viscosity is reached, and then pumped to the production tank for processing. The resulting savings in ingredients and the improvement in product quality paid for the installation in less than six months. 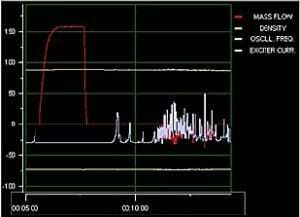 Diagnostics enhance measurements by alerting operato rs to abnormal process conditions or upsets. For example, entrained air in the line can cause process problems. An operator needs to know if external air is being drawn in through a leaking seal, a cavitating pump or an empty balance tank, because air in the process can affect product quality. A Coriolis flowmeter does not operate properly with large amounts of entrained air, so it has diagnostics to detect this condition. In an Endress+Hauser Coriolis meter, a diagnostic value shows that tube oscillation is in a good range, indicating no entrained air. If air appears in the line, the diagnostic value will change, setting off an alarm to the operator. How much time is being spent taking manual grab samples? 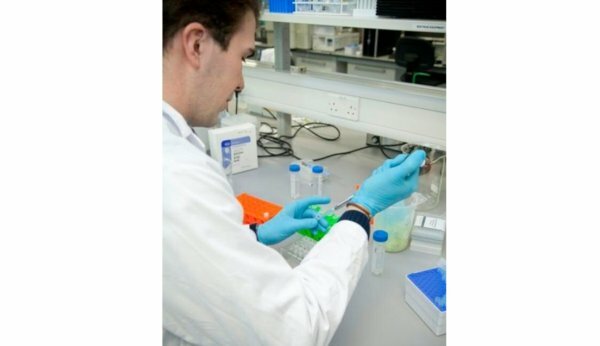 How much time is being spent running lab analyses? How many workers are needed for these tasks? How quickly does manual sampling detect process changes? How much does the delay in obtaining manual results affect product costs? The hydro cooker application discussed above is a good example of a plant that saved worker’s time by eliminating two grab samples per hour, and then saved on disinfectant chemical costs with timelier inline analysis. The next step is asking: Which of the inline measurements would benefit a particular process? For example, dissolved oxygen measurements in brewing, wine and juice production minimize oxidation of the product. Measuring the Brix of tomato paste can help control the amount of paste to be added during cutting. Viscosity measurements can improve the product consistency of batter coating for beans, onions, meat, poultry and other products.